CMMB (Catholic Medical Mission Board) enjoyed a special relationship with Mother Teresa of Calcutta. 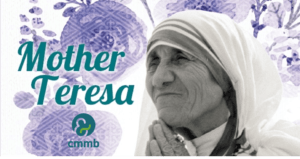 In the late 1970s, CMMB started sending approximately $5,000 worth of medicine to Mother Teresa and her mission in Calcutta to help with patients she served who suffered from leprosy. 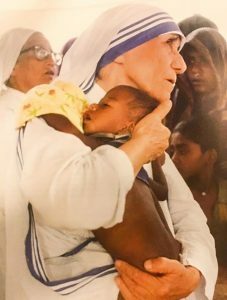 We remember Mother Teresa for seeing beauty in every human being and for choosing to “serve the poorest of the poor and to live among them.” We strive to work in solidarity with her mission, and seek to serve the most vulnerable women and children around the world, because they still remain marginalized and disproportionately affected by poor health and poverty. Our latest global campaign, Join Hands, was launched with this principle in mind. Click this image to sign up to receive a free Mother Teresa quote book. Albanian by heritage, the future Saint Teresa was born on August 26, 1910 in Skopje, Macedonia, then a part of the Ottoman Empire. Her father died when she was eight, and her mother opened an embroidery and cloth business to support her family. Always involved in her local parish, Anjezë (or Agnes) Bojaxhiu left home in 1928 for the Loreto Convent in Ireland, where she received the name of Teresa, after St. Therese of Lisieux, patron saint of missionaries. She took her first religious vows in 1929 and her solemn vows in 1937 in Calcutta. She had what she described as “the call within the call” when traveling from Calcutta to Darjeeling and began her missionary work living with the poor in 1948, adopting Indian citizenship and receiving medical training. Many inspiring quotes have been attributed to the Blessed Mother Teresa of Calcutta. For someone so close to CMMB’s mission, we have produced a few special items available to you. If you would like to receive a downloadable prayer card featuring the smiling saint with a special prayer on the back, please click here. If you would like to received a downloadable booklet of inspirations quotes by Mother Teresa, click here. Love is a core value of Catholic Medical Mission Board (CMMB) and we see it reflected in Blessed Mother Teresa’s work. It guides us to show compassion to others in a world that often experiences suffering and to begin loving each other and prayer for one another, starting in our own families and our own next door neighbors. Click this image to sign up to receive a free Mother Teresa prayer card.